So, a few things about this song. It's from an anime that I'm not super fond of, but I love the music (and yes, it's in English). And two, this and my M song were what kicked off this theme for me. As such this one's a bit....long. Sorry if that bugs you, and you can skip if you want, but you might be sad. “You can't wait outside the Gates.” He told the soul that had just appeared in front of it a minute ago. It was his favorite phrase. Or at least, his most common one. He wasn't Gabriel, his name was Fernando Munguia, but he didn't bother correcting the recently deceased. It was common Earth lore than the angel Gabriel guarded the Gates of Heaven, so they all assumed he was the fabled angel. Even though he didn't have wings. Or give off an aura. He did however have a flaming sword. He supposed that accounted for the misidentification most of the time. The man did and promptly forgot about his wife. Tabela Rassa, It was a type of mental state, he knew that much, but Fernando didn't know how he knew it. That didn't bother him though. Once you crossed the Gates, your mind went blank. You forgot about your life on Earth, and thus any ties to people there evaporated. A soul could walk side by side with their first lover and not know it. It hadn't bothered him when he'd been appointed as a Gatekeeper. Someone had simply pointed him to the booth just inside the Gates, led him inside, sat him down, and put a piece of paper on his lap. It had simply said 'Make everyone walk thought the Gates of Heaven'. And he did, not minding it until he met Kanno. Kanno had faded in like souls do, in the appearance they held as they died. Kanno was a small Asian boy, hair in an uneven cut, clothes sopping wet. He was still screaming his death cry even as his appearance morphed to it's ideal image, how a person saw themselves at their prime. The wet clothes changed, a matching outfit with robots on it took it's place. Usually at this point, the soul realized they were dead and stopped living their death. But not Kanno. “Yoko! Yokooo!” he was crying, spinning around frantically trying to find the aforementioned person. He had sighed, thinking what a hassle. This soul wouldn't got through the Gates on his own power so he had to go out and get him. It was the first time he had left the wall of Heaven. The first time he remembered his own name. My name is Fernando Munguia. The thought was so startling he dropped the sword he had acquired with the booth, the flames causing the clouds to hiss. Worried they would evaporate and leave him nothing to stand on he hurriedly picked it up back up again. He looked towards the boy. He had stopped crying, eyes wide and staring. “I'm Fernando.” He felt compelled to say. He had name, it was something to share. “K-kanno.” The kid had stammered back, eyes on the sword. Fernando felt like he wanted to do something else, but the only thing he could think of was that piece of paper, Make everyone walk thought the Gates of Heaven. He had a job. Kanno went running towards them, but slowed to a sedated walk as soon as he reached the golden Gates. The sound of Yoko's name on his lips died, and he went on silently. Fernando wanted to say on this side of them, he suddenly dreaded walking through the Gates, but the sword was burning his hand and the only safe place for it was in the booth. He hadn't forgotten the encounter with Kanno as he had expected. Well, not entirely. He did forgot once he crossed the Threshold of Heaven, but the next time he went beyond the Gate it came back to him along with his name for a second time. And now, now he remembered all the time, in the booth or not. He remembered information; most of the souls couldn't answer simple questions once they past through the Gates. How do mountains form? How long does a mother carry a fetus? How do you boil rice? The souls just smiled at him, said they didn't know, and walked towards the Cloud City. Fernando knew his name, he could answer the questions, but he still couldn't remember Earth. He didn't know how much time had passed between the old man waiting for his wife and her eventually appearance. She faded in lying flat on a cloud, garbed in a hospital gown, but after a few rattling breaths stood. Her appearance changed, short white hair becoming long and red done up in two buns at the base of her neck. She work faded green jeans, a short strapless sea green dress on over them. She obviously saw the Gates, they were impossible to miss, but she dismissed them instead to search around the clouds in front of it. There wasn't a lot of space, it was a quick look. “Walter?” She called out. The women smiled and practically skipped to the Gate. But she walked past the booth without a second look. Fernando didn't know how much time he spent looking at that sheet of paper, tacked onto the wall. Why was it so important that people enter Heaven? Why did they have to forget? Was it the same way in Hell? Was there maybe some type of limbo? The most recent couple hadn't been the only one, there were a lot of people who made similar promises, but something about the woman had triggered an image in his mind. Not a red head, the image was too blurry for him to make out hair and certainly not enough to remember her face, but he remembered the color green. A green dress, long and ruffled, and feeling of love for the woman in it. Had he made such a promise too, and broke it? He didn't know how long he stood outside the Gate, paying attention to the shifting clouds under his feet while straining his brain to remember something else about her. Nothing came, about her, but he now had the image of a black car in his mind, driver's side mirror taped on. The passenger's side was crunched in. The image came with sorrow and guilt. Souls still appeared and Fernando still sent them along, but he found himself drifting closer and closer to the edge of the clouds. He couldn't see anything under them, the fog was too thick, but it didn't prevented him from trying to catch a glimpse of something. The blue of Earth's water, the fires of Hell. Something. He was tired of white. He was tired of not remembering. Heaven no longer felt like Heaven. It was a couple this time, dressed in camouflage, wrapped around each other, and sporting the effects of what Fernando knew from conversations with other soldiers to be a bomb going off at close range. They were shortly followed by another solider, leg blasted off. The couple ignored him. They were unwinding from each other, eyes wide as they watched their appearance change. Wounds disappearing, camo fading away to dress uniforms. They started kissing. Fernando turned his head. The single solider had walked up to him while Fernando was observing the couple and was now staring up at the Gates. He wasn't in a uniform, and he had actually diminished in age. Most people saw themselves at their prime in their 20s. The solider was now maybe thirteen wearing khakis and a pale pink polo. Just after he was through them, the male of the left behind couple yelled. “Wolf! Wait up!” But the young boy didn't turn around. “The draw of the Pearly City too much for most people?” He smiled and looked down at his partner. He obviously found her more interesting then Heaven. Joe pulled her tighter just thinking about it. “Me too Gloria.” He looked behind him, at the edge of the clouds. “What happens if we jump?” he asked Fernando. 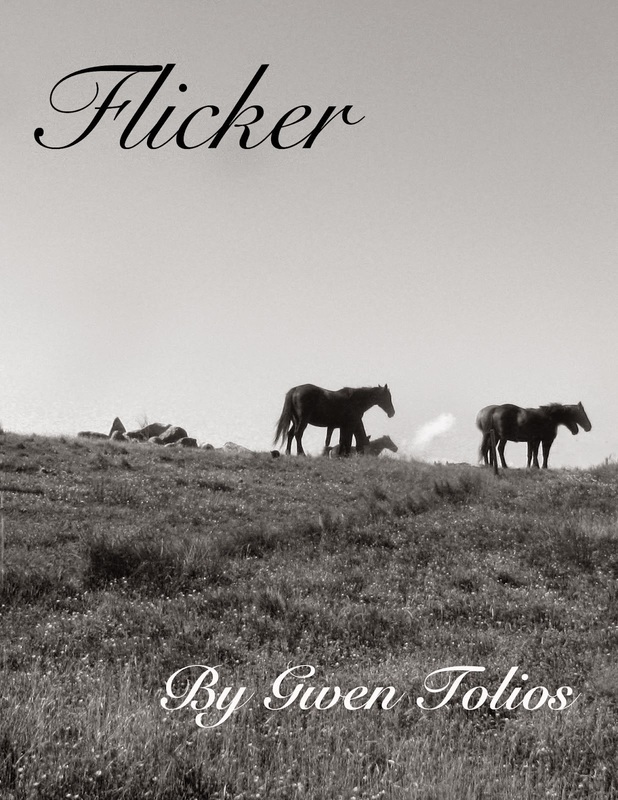 Gloria nodded against his chest and then they were running, the clouds ran out, and they were falling. Fernando ran to the edge. He just caught the sight of them spread out like Xs, their hands clasped together. Fernando stared at the piece of paper. It glowed, that one sentence the only thing he had to do and the one thing he had failed. Make everyone walk thought the Gates of Heaven. But Gloria and Joe, the solider couple, had decided to throw away a chance of happiness to be with each other, to remember one another. He turned his attention back to what he remembered of Earth. His facts, the green dress, and the car. What he wasn't remembering, the connection he felt, was awful. It was worth a few tears at least. So why wasn't he crying? Why couldn't he remember? God-damned Heaven getting in the way. He ripped down the paper. Or tried to, it refused to rip but it still fluttered to the floor. There, carved into the booth, were the words 'Heaven's not enough'. Fernando thought about his predecessor for the first time, had he jumped? Gotten tired of the clouds and blank looks on people, of trying to remember but not being able to? He ran his fingers over the carved words. The only thing that could have possible carved them was Gabriel's flaming sword, but Fernando could never imaging handling the weapon with the finesse required to carve such smooth words small enough to fit behind a single sheet of paper. Fernando walked through the Gates, stopping at the edge of the clouds, praying for some sign of what he should do. God was so close, surely he would answer. A name floated up the fog, Juliana. Her name. He dived off the clouds. She used to come to the school's swim meets.